ReceptionMagazines.com is a subagent for the individual magazine publisher - its role is to forward subscription orders to the magazine publishers via its clearing houses. ReceptionMagazines.com is not in any manner involved in the editorial, creation, printing, fulfillment or mailing of the magazines - this is the role of the publisher. ReceptionMagazines.com's responsibility is limited to forwarding the subscriber's order to the publisher. If, for any reason whatsoever, ReceptionMagazines.com is unable to fulfill an order for a magazine subscription, its sole and total liability and obligation is limited to a refund for the actual money paid by its customer for the subscription. 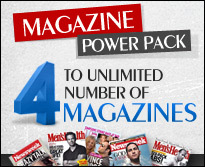 In the event that a magazine ceases publication, ReceptionMagazines.com is not responsible for providing an alternative publication. This is the sole obligation of the magazine publisher. The industry practice is to provide a substitute publication similar to the magazine that ceased publication.